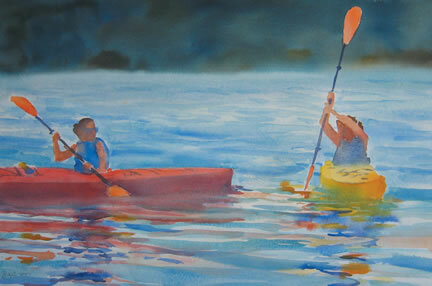 Atmospherics, light, contrasts, gesture and composition are among Suzanne's special qualities in her watercolors. She teaches private watercolor classes and holds watercolor workshops in Maine and Connecticut. Suzanne is represented at Landing Gallery in Rockland ME, Greene Art Gallery in Guilford, CT, Charlestown Art Gallery in Charlestown, RI, and Isalos Gallery in Stonington, ME.